Reflections of a Bookaholic: Bookmarks!! I found these cute book spine bookmarks by way of Pinterest. Which led me to Green Paper and then of course to Etsy (P.S. I love vintage! ), which is where I always end up. I think the bookmarks are a creative way to deal with old books that are kind of falling apart. But I'm not sure I could do it. You know... make that final tear. What about you? They are falling apart any way right? But I do feel guilt-free just buying them. I don't write in books either. I think the books would have to be so horrible that I need to take them out of their misery. Is that possible? I agree. It's so hard to imagine but they are super cute. These are awesome! I understand how you could feel guilty. I personally would not do that to a book but I do see myself buying these. Maybe because the damage is already done? They are lovely but I am torn (get it, torn?). Lol. I get it. That was a good one. I really did laugh. Oh I would love these. But I am with you, I might tear up if I have to rip apart an old book! I know. I would feel pretty bad. But I wouldn't feel the same if I was buying it. Go figure. Ohhhh. Those are TOO adorable! If it was totally falling apart (I have one in that condition actually - it's even missing pages) I could do it. But only in that case. Great find though. These are super dooper cute! Missing pages is definitely a sign that there is nothing one can do to save the book. That's definitely a time when I'd feel less bad (wondering about my phrasing). I think it's very creative!! they look lovely and most people would just throw away a book that was falling appart anyway. I wouldn't because I don't throw books away. But if the alternative is throwing it away, this is definitely a better use. I like them, too. And I think it's a better use for all those old books that end up as part of the window display at Anthropolgie. Oh my gosh! Those are totally awesome! I would never have thought to do that but this is such a neat idea! And an easy way to recycle or reuse an old, falling down book. Nice find! I couldn't do it! At all! 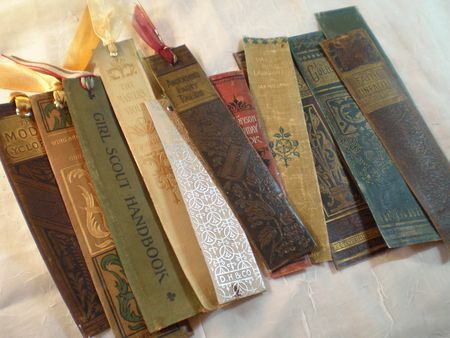 But I would love love to have the Girl Scout Handbook bookmark. But it is a great idea. By the way...Welcome Back! Thanks! It actually feels weird being back. But I missed it so. I love these vintage bookmarks too, I hope I can find similar ones here in our place. Thanks for sharing. I love Etsy ^^ and I like these bookmarks too, but I couldn't do it! While I am horrified by people who write in books, dog-ear them, etc., once a book is old and falling apart, I'm generally ok with destroying them for artsy purposes. :) I recently bought a couple of paperbacks that were in really rough shape at a yard sale, and I'm going to use the pages to make wedding decorations! Oh I bet that would look awesome!